The Patriot Guard Riders would like to recognize your continuing support by offering a Limited Edition pin. These pins cannot be purchased, they are being offered as a gift when you donate $50.00 or more to the PGR. Simply click the “I Support the PGR” option on the donation page. Include your address when filling out the donation form, and the pin will be shipped directly to you. 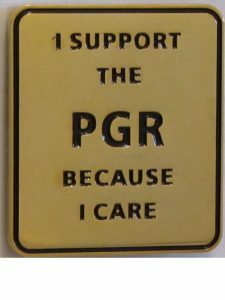 Additionally, any donor that donates $100.00 or more will receive the pin and a plaque to display showing you support the PGR. Any person, business, group, or organization donating $500.00 or more will receive the pin, plaque, and their name will be displayed on the welcome page of the National website. As our members are all volunteers, 100% of your donations are utilized to conduct our missions Nationwide.